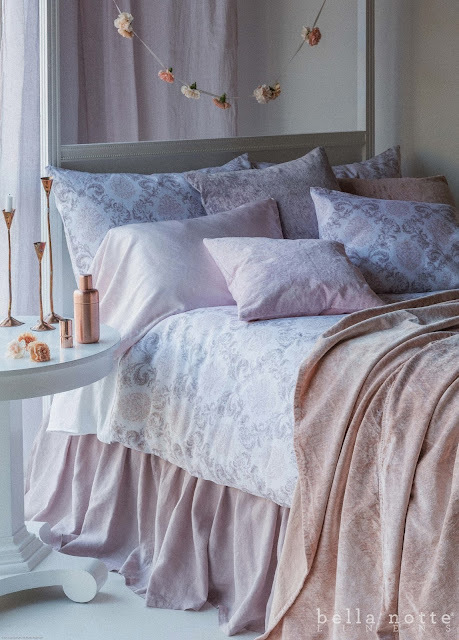 Meet Bella Notte Linens Zia. Zia is a vintage damask pattern influenced by Indonesian textiles expertly printed in three tonal colorways on linen. 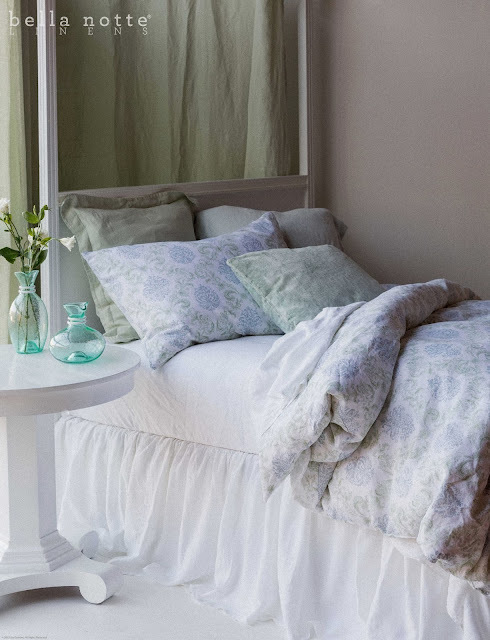 New for Spring 2014, Bella Notte Linens Zia is offered on White Linen and is not overdyed. Zia, embellished with faded charm, is available in Natural (Ginger, Sable, and Flax), Cool (Silvermist, Seaglass,and Mint Julep), and Warm (Perfect Peach, Petal, and Powder). Above. Zia-NATURAL Duvet Cover and Zia-NATURAL Standard Pillowcases paired with Trecento Pillow Shams in Flax and Ginger. Above. Zia-COOL in Duvet Cover and Zia-COOL Deluxe Sham paired with Trecento Shams in Mint Julep, Hendrix Throw Pillow in Mint Julep, White Linen Sheets, and a White Linen Bedskirt. Above. 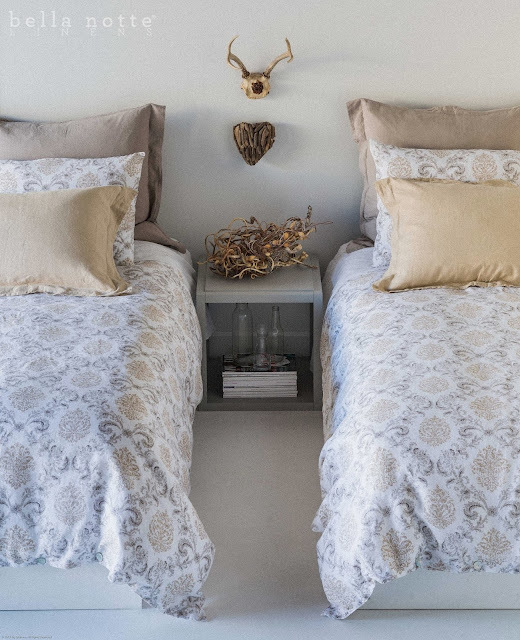 Zia-WARM Duvet Cover, Zia-WARM Deluxe Shams, and Zia-WARM Standard Pillowcase paired with Trecento Pillowcases in Petal and a Linen Bedskirt in Petal. Above. 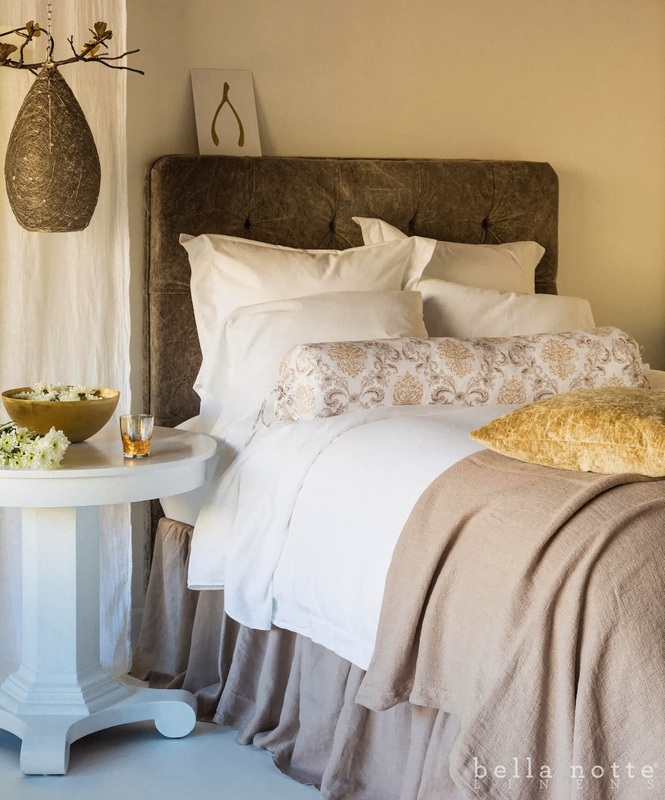 Zia-NEUTRAL Bolster paired with Trecento White Duvet Cover, Pillow Shams and Pillowcases.